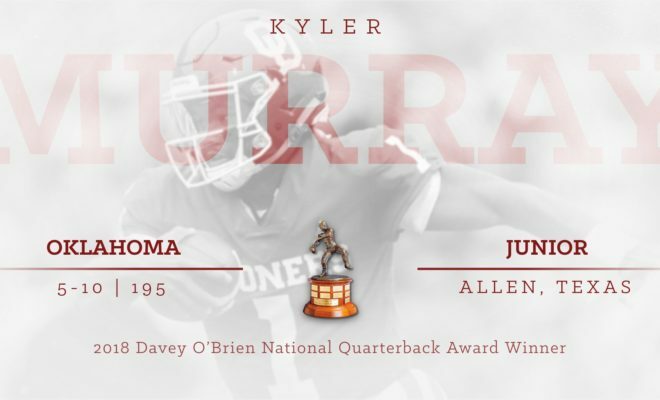 FORT WORTH, Texas (Dec. 6, 2018) – Oklahoma junior Kyler Murray has been named the 2018 Davey O’Brien National Quarterback Award winner, becoming the fourth different Sooners player ever to claim the nation’s oldest and most prestigious quarterback trophy. He is the second straight honoree from the school. Murray joins Jason White (2003-04), Sam Bradford (2008) and Baker Mayfield (2017) as winners from Oklahoma. The five Davey O’Brien Awards won by Oklahoma quarterbacks are the most by any school in the nation, surpassing BYU’s four. On the year, Murray is 241-for-340 (.709) passing for 4,053 yards and 40 touchdowns. He also has rushed for 892 yards (7.8 yards per carry) and 11 scores. He leads the nation in passing efficiency (205.7), total quarterback rating (96.0) and yards per pass attempt (11.9), and is tied for first in points responsible for (306). Murray also ranks among the NCAA’s top three in total offense per game (2nd, 380.4), completion percentage (2nd, .709), passing touchdowns (2nd, 40), yards per completion (2nd, 16.8) and passing yards (3rd, 4,053). In 2018, the 5-10, 195-pound quarterback has directed the nation’s No. 1 offense (49.5 points and 577.9 yards per game). He has thrown for more than 300 yards nine times and has rushed for 100 yards twice. Murray also has accounted for four or more touchdowns nine times. The Big 12 champion Sooners own a 12-1 record and earned a berth in the College Football Playoff as the No. 4 seed. In the Big 12 Championship Game against Texas on Saturday, Murray completed 25 of 34 passes for 379 yards and three touchdowns with no interceptions. The game’s Most Outstanding Player also added 39 yards rushing to top the 400-total yard mark (418) for the sixth time in 2018. Murray is ahead of Mayfield’s all-time NCAA passing efficiency record of 203.7 set last year. He also is the first player in history to enter the bowl season averaging more than 300 passing yards (311.8) and 60 rushing yards (68.6). His 51 total touchdowns accounted for are the most by an O’Brien winner since Oregon’s Marcus Mariota (57) in 2014. The Allen, Texas, product is the ninth quarterback winner to star as a prep in O’Brien’s home state of Texas, joining Michael Bishop, Ty Detmer, Robert Griffin III, Johnny Manziel, Mayfield, Colt McCoy, Andre Ware and Vince Young. 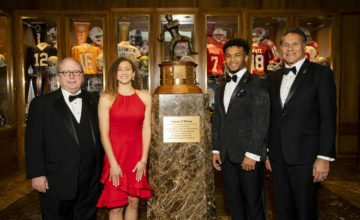 Young presented Murray with the trophy live on ESPN’s Home Depot College Football Awards Show. Including Murray, over the past 11 years, the Davey O’Brien Award winners’ teams have combined for an overall record of 139-14 (.908). He is the fifth straight winner to lead his team to the College Football Playoffs, joining Mariota (2014), Clemson’s Deshaun Watson (2015, 2016) and Mayfield (2017). Two winners in the past five years ultimately claimed national championships (Florida State’s Jameis Winston in 2013 and Watson in 2016). The other two finalists were Washington State senior Gardner Minshew II and Alabama sophomore Tua Tagovailoa. Ballots were tabulated from the Davey O’Brien National Selection Committee, which includes select media members and all former winners, and combined with the fan votes recorded at VoteOBrien.org, which accounted for five percent of the process. Murray is one of three finalists for the Heisman Trophy, which will be announced Saturday. 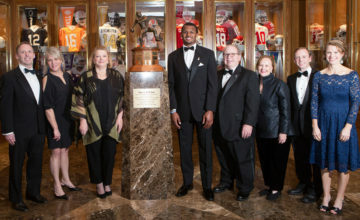 Six of the last eight players to win the Davey O’Brien Award—Cam Newton (2010), Griffin (2011), Manziel (2012), Winston (2013), Mariota (2014) and Mayfield (2017)—went on to be awarded the Heisman Trophy. Dating back to 2006, nine of the 12 O’Brien winners claimed the Heisman. Murray will be honored at the 42nd Annual Davey O’Brien Awards Dinner on Monday, Feb. 18, 2019, in Fort Worth, Texas. The award is overseen by the Davey O’Brien Foundation, which is headquartered in Fort Worth, Texas, and has given away more than $1 million in scholarships and university grants to help high school and college athletes transform leadership on the field into leadership in life. For more information, visit www.DaveyOBrien.org. 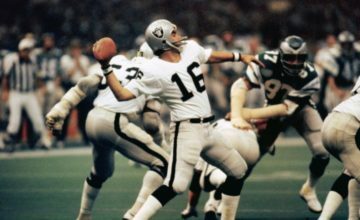 Previous National Quarterback Award winners include: Jim McMahon (BYU, 1981), Todd Blackledge (Penn State, 1982), Steve Young (BYU, 1983), Doug Flutie (Boston College, 1984), Chuck Long (Iowa, 1985), Vinny Testaverde (Miami, 1986), Don McPherson (Syracuse, 1987), Troy Aikman (UCLA, 1988), Andre Ware (Houston, 1989), Ty Detmer (BYU, 1990-91), Gino Torretta (Miami, 1992), Charlie Ward (Florida State, 1993), Kerry Collins (Penn State, 1994), Danny Wuerffel (Florida, 1995-96), Peyton Manning (Tennessee, 1997), Michael Bishop (Kansas State, 1998), Joe Hamilton (Georgia Tech, 1999), Chris Weinke (Florida State, 2000), Eric Crouch (Nebraska, 2001), Brad Banks (Iowa, 2002), Jason White (Oklahoma, 2003-04), Vince Young (Texas, 2005), Troy Smith (Ohio State, 2006), Tim Tebow (Florida, 2007), Sam Bradford (Oklahoma, 2008), Colt McCoy (Texas, 2009), Cam Newton (Auburn, 2010), Robert Griffin III (Baylor, 2011), Johnny Manziel (Texas A&M, 2012), Jameis Winston (Florida State, 2013), Marcus Mariota (Oregon, 2014), Deshaun Watson (Clemson, 2015-16) and Baker Mayfield (Oklahoma, 2017).